Compare discounts for Hotels Resorts in Maui, Hawaii! For many people the words Maui and Hawaii are synonyms. They stand for endless sun, deep blue waters, romantic sunsets, amazing scenery and total relaxation, and rightly so. These days, Maui, nicknamed 'The Valley Island' is the main vacation destination in the Hawaiian Islands outside of Waikiki. With many points of interest all within a few hours drive Maui has a diverse offering packed into a small compact area. On the northwestern part of the Island the former whalers' village of Lahaina offers active nightlife while Kaanapali and Kapalua host luxuries destination resorts with excellent beaches and golf courses. Kihei and Wailea, on the southwestern part of the island are home to numerous budget resorts and condo developments and some of the best swimming beaches in Hawaii. The road to Hana on the far eastern side of Maui is one of the most scenic drives in the world, winding between lush vegetation, secluded bays and numerous waterfalls. Haleakala National Park, in which one of the world's largest dormant volcanoes is located, offers a magnificent view and the unique scenery of a volcanic area located 10,000 feet above sea level. From the beach to the mountain, and from the spa to the gold course, Maui is coming as close as any place can to being a perfect getaway destination. Note: Lists are not identical. 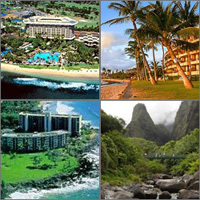 Different sites offer different accommodation options for Maui. The Grand Wailea Resort Hotel and Spa is located on beautiful Wailea Beach in sunny South Maui. Hyatt Regency Maui Resort and Spa is a five-star luxury resort, located on a 40 oceanfront acres, at the south end of the Kaanapali Beach hotel row. The Westin Maui is a full-service luxury resort located on Kaanapali Beach in northwest Maui. Hotel Hana Maui, at the end of the Hana Highway, is an intimate, secluded resort that has welcomed visitors for over 50 years. The Sheraton Maui Hotel is a 23-acre beachfront resort located next to the landmark Kaanapali Black Rock at the northern end of Kaanapali Beach. The Marriott Wailea Outrigger Resort is located on 22-acre in South Maui's exclusive Wailea resort community, steps from the elegant The Shops at Wailea, minutes away from three championship golf courses and 17 miles from Kahului Airport. Wailea Grand Champions Maui is a condominium resort located in exclusive Wailea, one and a half miles from Kihei. Kihei Beach Condos is an all beachfront condominium resort located in North Kihei on Sugar Beach. Maui Coast Hotel is a full-service resort centrally located in downtown Kihei Town on the South Maui coast, within walking distance to Kihei's shopping and dining attractions. The Maui Seaside Hotel is located in central Maui on Kahului Bay just 20 minutes from the resort area of Wailea and a scenic 45 minute drive to Kaanapali. Maui Oceanfront Inn is a moderately priced inn located on Keawakapu Beach in South Maui, within walking distance of casual restaurants as well as fine dining, nearby shopping, watersports and nightlife. Maui Lu Resort is a value priced resort located on 28 lush acres. Maui Parkshore Condos are located directly across the street from the Pacific ocean, in the town of Kihei on South Maui's Sun Coast. Wailea Ekahi Villas is a condominium resort located in South Maui, overlooking Keawakapu Beach on the Kihei Shore. Ritz-Carlton Kapalua is a 5 star luxury resort, located on 50 acres of tree-covered hillside near Maui's northwest tip with views of the ocean and the island of Molokai.